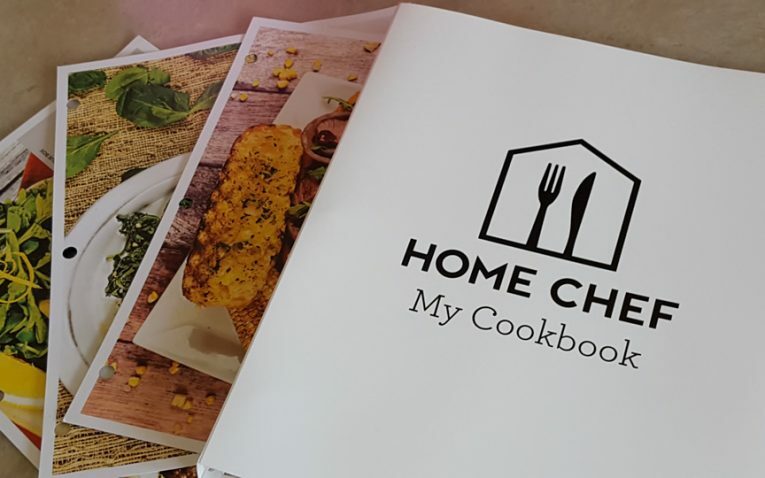 Home Chef was created with one goal: to provide the home cook with the freshest ingredients, innovative recipes and a tasty home cooking experience. They pride themselves on simplicity, but robust flavors. With their chef-created meals, culinary tips and lessons, they strive to turn every home cook into a true home chef. A meal delivery kit that focuses on turning even the most novice cook into a gourmet home chef. 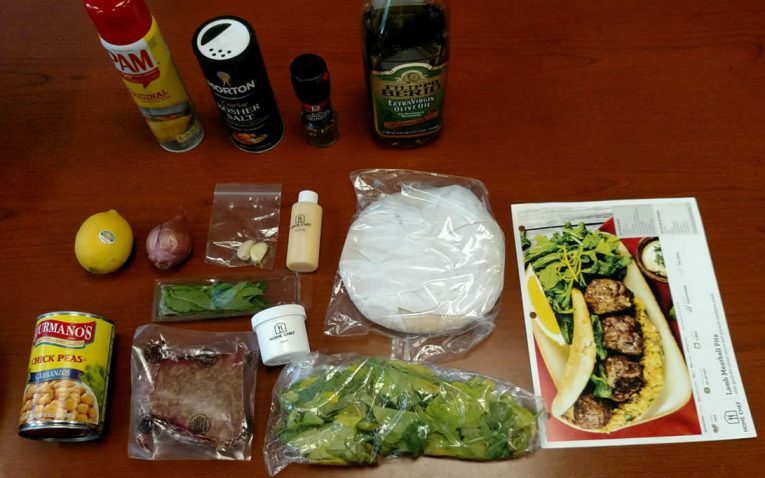 Who Would Enjoy This Meal Delivery Kit? Home Chef lets you choose from 10 meal options each week! This is one of the largest varieties compared to the competition. They let you choose from meat, seafood and vegetables. Then, they will offer you meals that meet that criteria. You can pick from the week’s menu and there are no combination limits. In your taste profile, you can choose up to eight weekly meals with as many as eight servings per meal – again, one of the highest we’ve seen. You will then select if you prefer meat, seafood or vegetables. They also let you select which meats and products you avoid – such as gluten, dairy, etc. If you are on a low calorie or low carb diet, you can add that to you preferences. Home Chef doesn’t have dedicated boxes for vegan, gluten-free, etc. While they let you pick and choose in the taste profile, they cannot always accommodate special concerns – and you certainly wouldn’t get eight meals for eight people all gluten-free that week. When you first sign up, you are only allowed to pick up to six meals per week and six servings per meal. This can be confusing – especially because once you go into your profile you will find that these amounts increase. You can pick and choose from over 10 meals per week without combination limits. 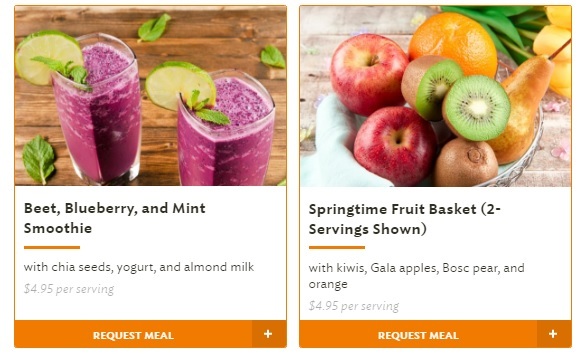 Home Chef also has extras each week like smoothie kits or fruit that you can add to your week – the price per serving is lower and will depend on what you choose. 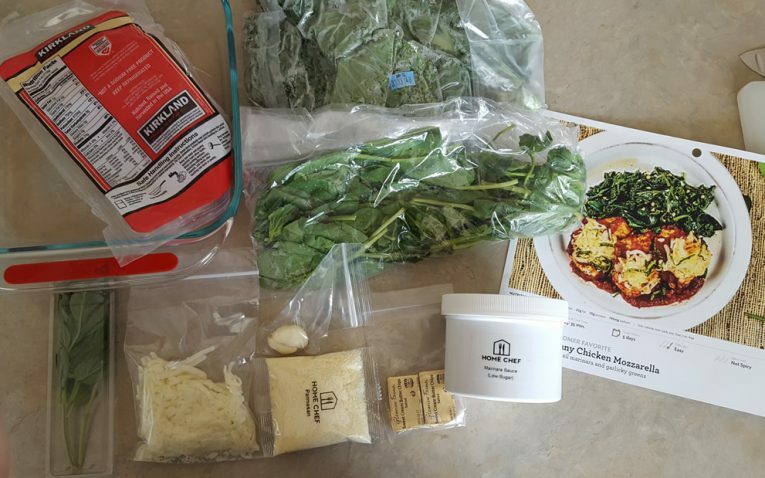 If you want to skip a week, Home Chef makes it fairly simple to figure out. You will, however, have to tell them why. Also, there are no contracts. As long as you cancel before the next week’s shipment is prepared, you will not be charged. Nothing here. We found that Home Chef is extremely flexible and accommodating to their customers’ needs. 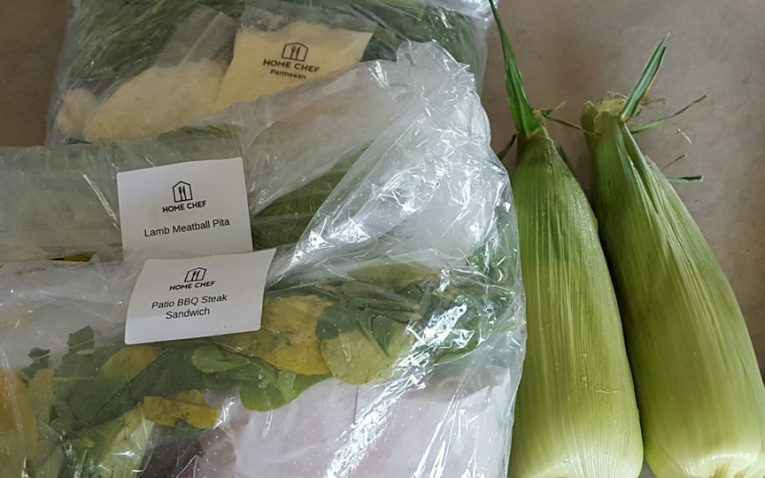 Like other meal kit services, Home Chef relies on fresh herbs for most of their flavor – with the addition of Kosher salt and pepper at home. Fresh herbs to elevate the recipe and give it a clearer taste. 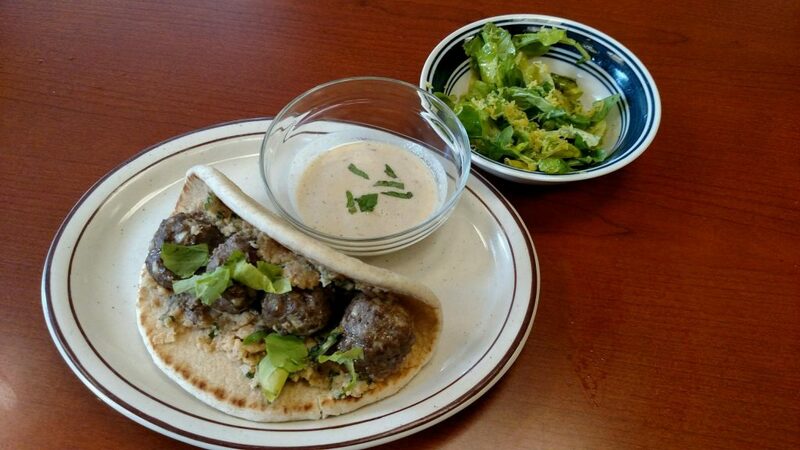 Out of the three recipes we received, one was definitely a new experiment – Lamb Meatball Pita. The other two recipes were fairly basic and something most people are likely to have already eaten. 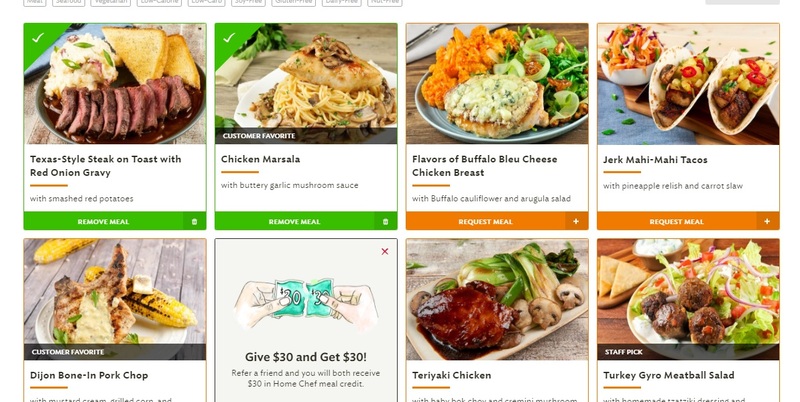 Home Chef lets you choose between a good spread of meals each week and they do have an interesting variety -with no combination limits. So, you are free to pick and choose six meals out of your 10+ options. Nothing. 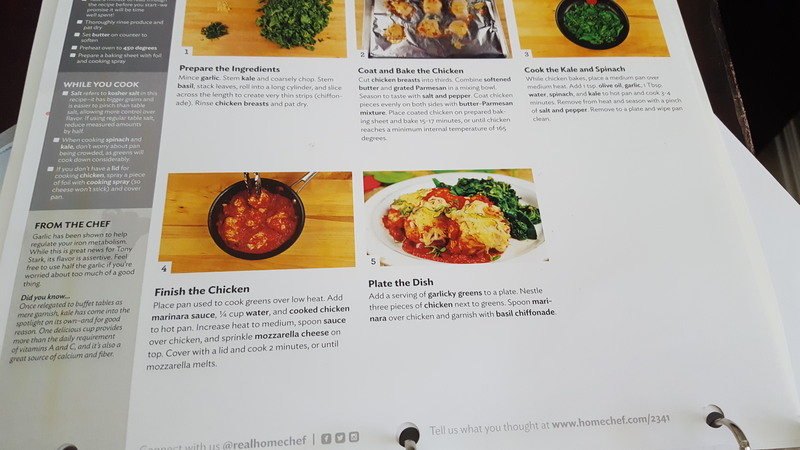 Home Chef does have a great variety with their meals and offer standard meals you would recognize and want to eat as well as stuff that lets you branch out. Nutritional values are provided online when you browse recipes as well as clearly listed on the recipe card. Their meals range anywhere from 500 to 1,000 calories or higher – depending on what you choose. If you select the Low Calorie option on your taste profile, you will only be presented with low calorie options for the week. 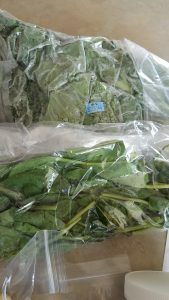 Most of the greens were extremely fresh and the packages they use help the produce breathe – so it doesn’t soggy up while storing. 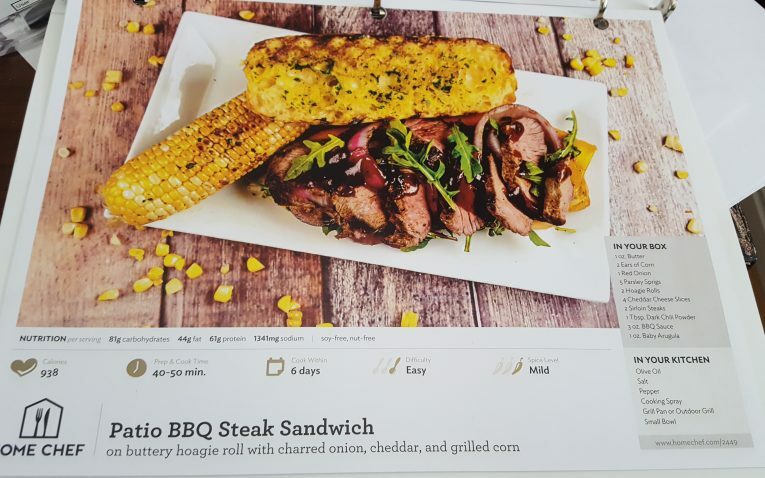 In comparison to other companies, Home Chef’s meals have some serious calorie counts. One meal of mine had more than 1,000 calories per serving! 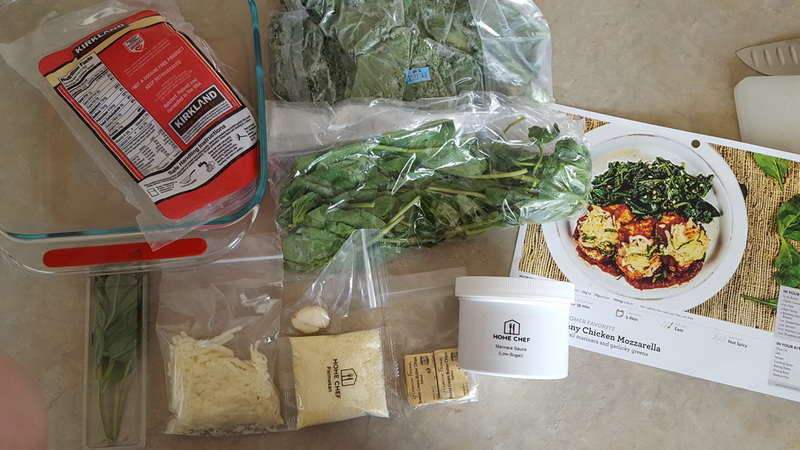 Other meal delivery kits we’ve tried had generous portions, great flavors and didn’t necessarily pack on the calories. 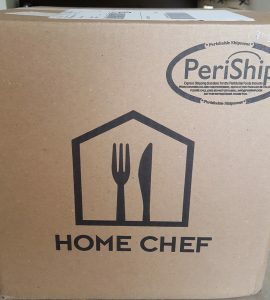 When it came to quality, I was disappointed with Home Chef. First, the meat itself had a weird smell. While that is normal when you store fresh meats, other companies found a way to ship their meat fresh enough to avoid the smell – which is why we’re holding it against Home Chef. Also, some of my greens were wilted or unappealing looking. 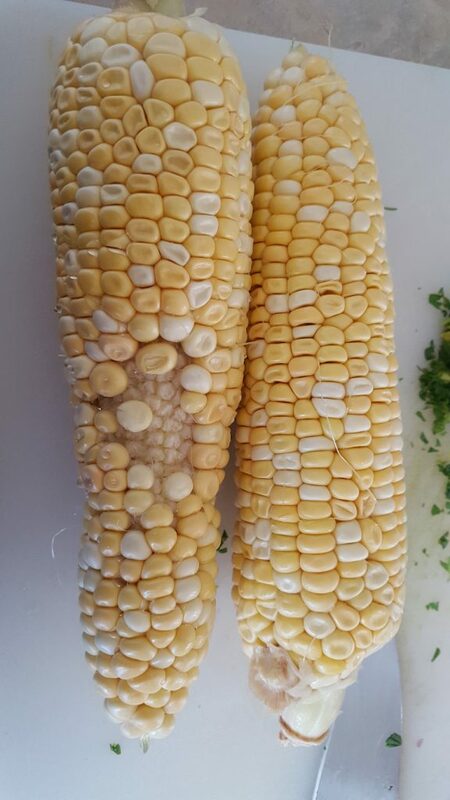 My corn had large chunks missing too. 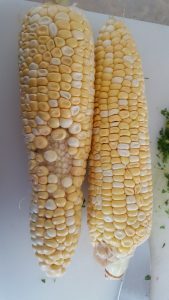 Sure, you cannot predict how corn looks under that husk, but when you feel the corn you could feel the dents and missing kernels – so in this case, I’m mentioning it. My beef was brown. Again, this doesn’t mean the beef is bad or going to make you sick – but it sure makes it unappetizing. Especially when other companies were able to deliver meat that was still red and super fresh looking. 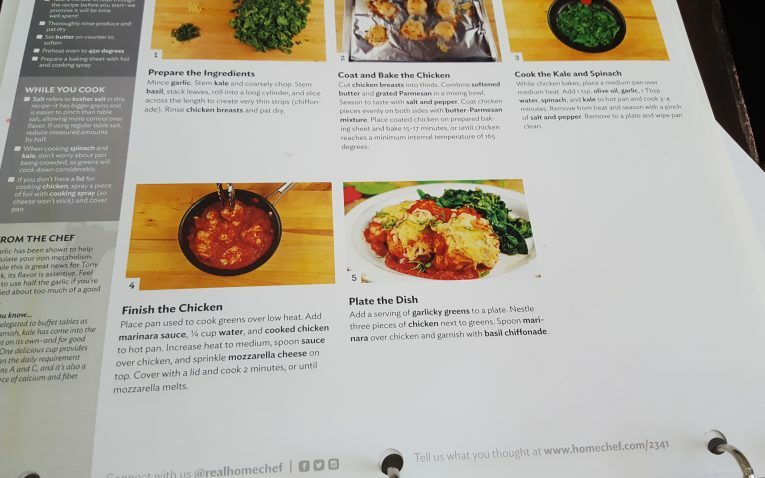 Home Chef charges a flat rate for their meals at $9.95 per serving. All boxes ship free if the total order is $40 or more. If you do not order more than $40 in your meal kit, then you will pay $10 for shipping. You can order as many meals as you would like and the per serving price does not fluctuate based on the type of meal box you order. Compared to other dinner kits, $9.95 is comparable and even affordable compared to others. 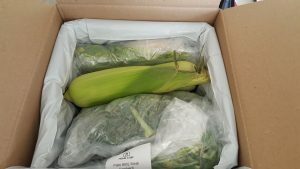 Most companies offer a slight per serving discount if you order vegetarian boxes – but with Home Chef, you pay the same price as if you were ordering meat. Hopefully they find a better way to balance the cost in the future. 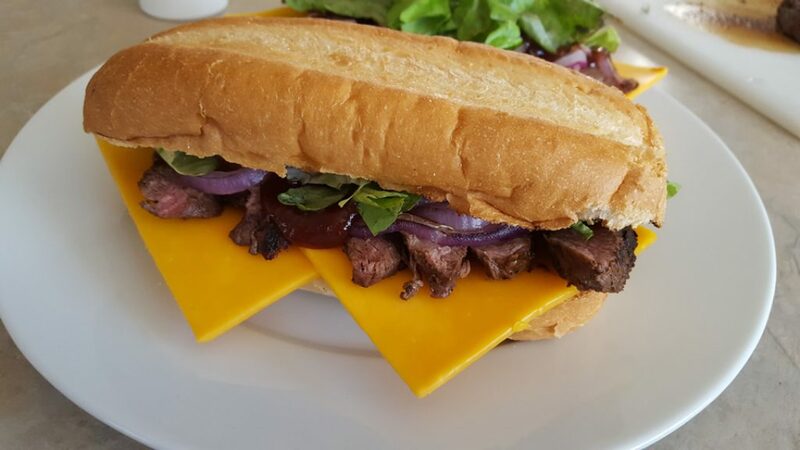 We personally tested and scrutinized recipes from Home Chef – see the results right here! Out of the three recipes we tried, only one would I repeat. 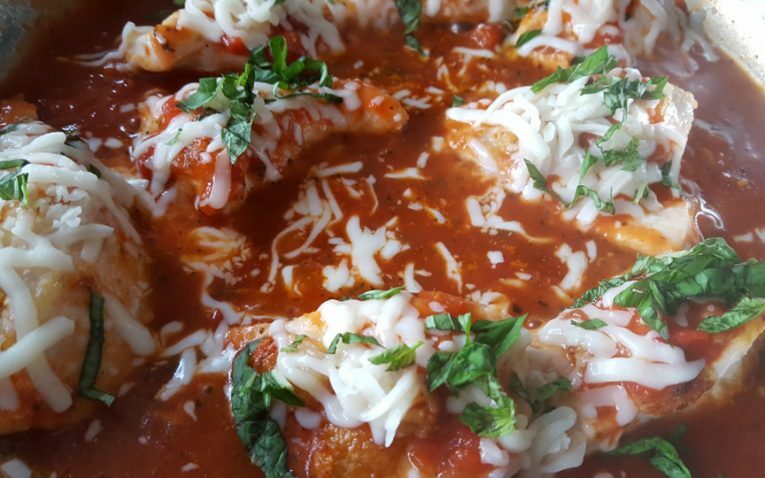 The Skinny Chicken Mozzarella. It was actually quite tasty – and something I’ll recreate at home. 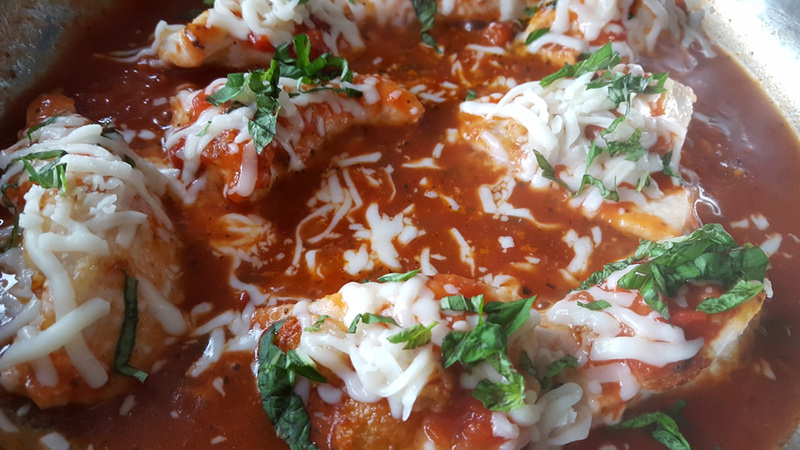 Even better, it taught you how to indulge in cheesy chicken while staying under 600 calories! The recipe cards have step-by-step instructions and even include pictures – though the pictures really don’t teach you much. One thing I really liked about Home Chef is their tips. 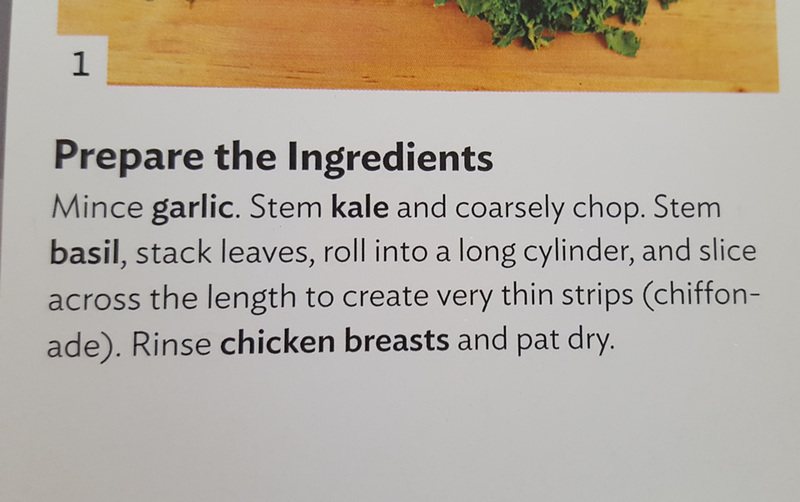 They offer not only quick tips on the side of the recipe, but in the recipe they tell you the culinary technique you are using and HOW to use it. Most companies just say “dice” or “thin slices,” but Home Chef takes it a step further – and I appreciate that. They also provide exact measurements with added ingredients (like olive oil). But, in addition to that, they actually list the ingredients and their amounts total on the recipe. That way if you wanted to recreate the recipe later on – without reordering it – you could go shopping and know just how much to add. 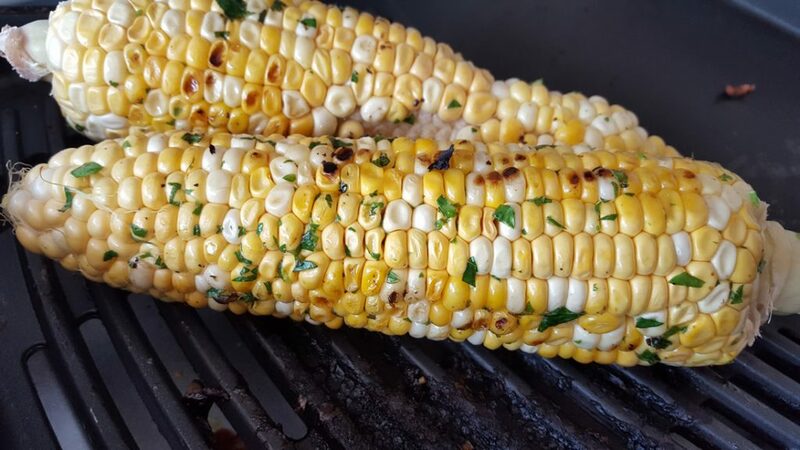 Home Chef’s recipes are simple, but in a way, they are too simple. Out of the three recipes we tried, I would say I would only repeat one of them. 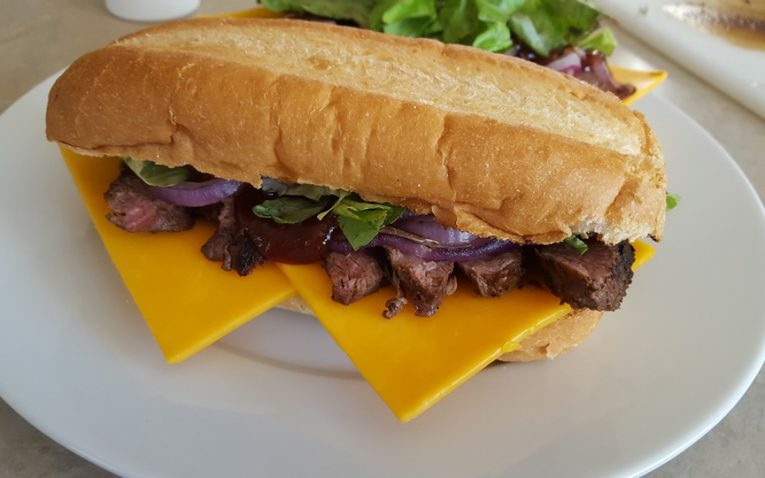 The BBQ sandwich, for example, was easy to prepare, but had absolutely no flavor except the BBQ sauce. 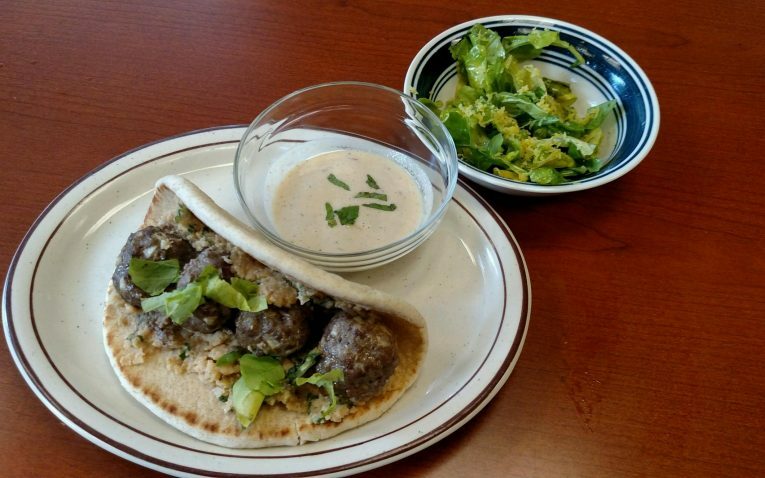 The lamb pita sounded so great, but when we went to eat it, we found it to have competing flavors. Each component on its own was great and very flavorful, but once together, it just had an odd sour taste that was not appetizing – and definitely not something we would eat again. Upon arrival, the Home Chef box looked a lot smaller than the other companies, but it turned out just fine. When you first open the box, you are greeted by this week’s recipes. 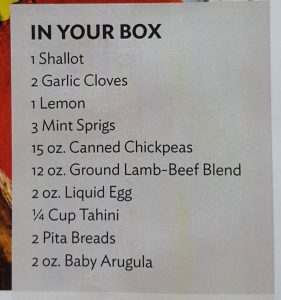 Below the recipes are the kits and produce. The recipe packs are in bags instead of boxes and each one is clearly labeled so you know which is for what recipe. They strategically place items that need to remain cold on the bottom so that they are in contact with the ice while the produce is at the top – which doesn’t need refrigeration. The meats are squished at the bottom of the box under ice packs. Unfortunately, my package of chicken leaked all over. So, I had to wash off the other packages. Because I’m a freak about food safety, I tossed the chicken. The package of chicken had been sliced – and I’m assuming those packaging the kits would have noticed when they placed it in there. I notified Home Chef and they credited my account. Only issue is, without the chicken, you can’t really make that dish – unless you go to the store and buy chicken (which I did). Also, the items were not as cold as other companies. While the meats and temperature-sensitive items were within a safe range, stuff at the top of the box was room temperature warm. Other companies I’ve tested kept the entire box chilled – so hopefully they can work on this in the future too just for food safety’s sake. According to my shipment information, the box was delivered about 1pm on my porch and it was about 80 degrees outside – I didn’t retrieve it until 4pm. I’m worried it would have warmed up considerably had it waited longer. Last, there are no labels on the fresh herbs or meats. When you sign up, you can choose your delivery day between Wednesday, Thursday or Friday. You can then see your upcoming delivery schedules on a calendar. 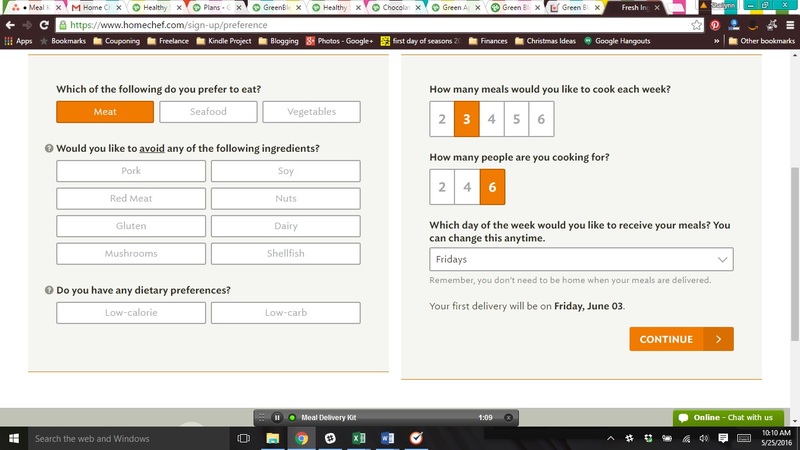 If you click on the date, you can see what meals are being delivered, how many servings, etc. You can also alter your number of servings or meals each week – you don’t have to commit to the same numbers you used at signup. Shipping is free on orders over $40. They do ship in the summer, which is great. 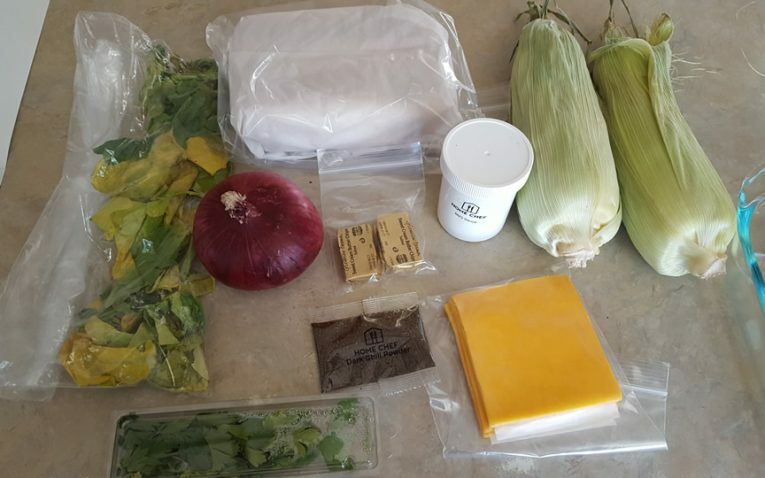 If you don’t order more than $40 in a meal kit, you will be charged $10 for shipping. Considering this is almost the cost of an extra plate, you might as well just increase the servings on one meal. That being said, there are tons of companies that offer free shipping regardless of dollar amount – so hopefully Home Chef can add that in the future. 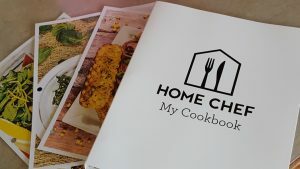 Home Chef does not deliver to all areas of the United States. While most cannot deliver to Alaska or Hawaii, Home Chef also has blackout areas in parts of Texas, New Mexico, Louisiana, Oklahoma, California, Oregon, and Washington. You will have to use their zip code tool to see if you can receive Home Chef at your residence. Most companies deliver to just about everywhere – except Alaska and Hawaii. So, hopefully they can increase delivery span in the future too. You can give the gift of Home Chef to friends and family. Currently they offer gift card amounts set in $60 increments – going up to $240. But, you can also customize the amount for the gift card to meet a certain number of meals and servings per week if you would like. While they don’t let you gift a meal plan specifically, the gift card is probably best. 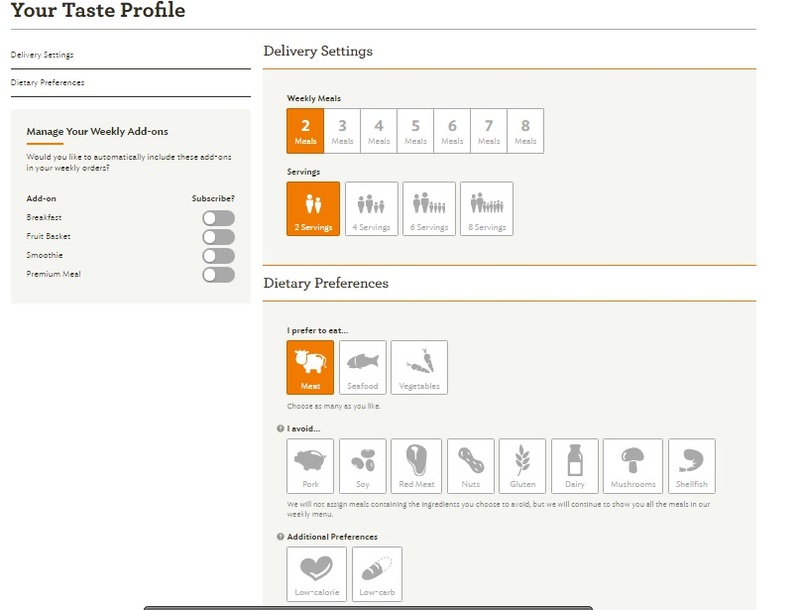 It allows recipients to choose which meals they want from their profile. So we aren’t holding that against Home Chef. Home Chef does have an extensive FAQs – so if you ever have a question, you might find the answer there and not even need customer service. That being said, if you do need to contact a human being with a question, Home Chef is fairly accommodating. They have email for customer support – which is easiest and they respond in less than 24 hours. You can also contact them via phone on their toll-free line Monday through Friday from 9am to 6pm CST. 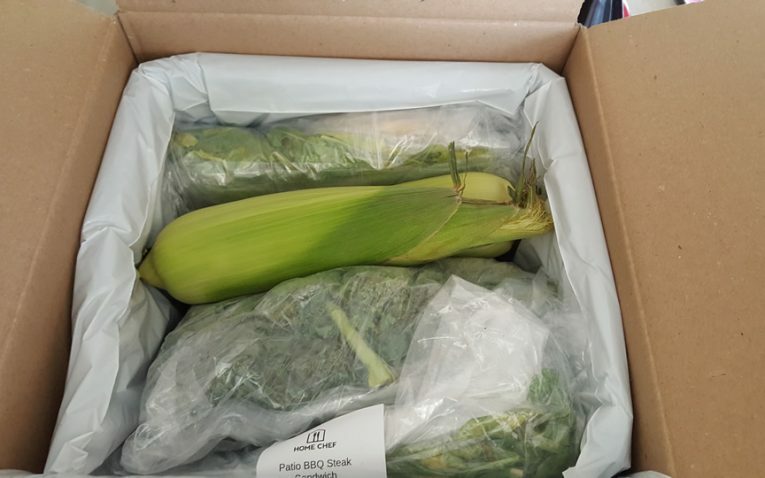 Home Chef does guarantee the products they send to you. If there’s an issue, you can report it over the phone or email and they will do what they can to make it right. They don’t have live chat at this time. In my own test, my chicken leaked and was unusable. Customer service responded within three hours to my email and credited my account. But, they only credited $10 – about the cost of a serving. While this is more than enough to make up for the fact I had to purchase my own chicken to complete the dish, I did pay per serving and for the convenience of having a meal ready to go. That night I couldn’t cook our meal – and for some people, that might mean PB&J until they can get to the store. So, in reality, a refund of two servings probably would have been more justified. That being said, at least they gave something – not all companies do. Home Chef is a standard $9.95 per serving regardless of meal plan or number of meals selected each week. Shipping is free on orders over $40 or $10 per shipment if under $40 total. I would definitely put Home Chef in the novice category – meaning you don’t need a ton of cooking experience to use them. Their recipes are very well written and easy to follow. 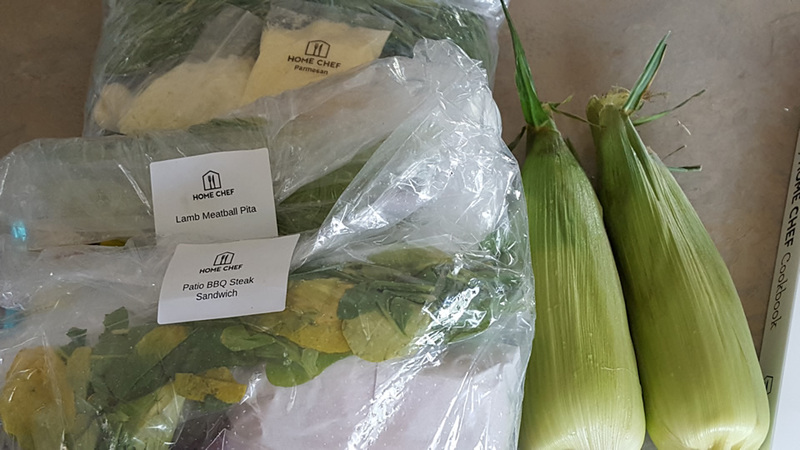 They even offer culinary tips, lessons and more so that you walk away from each recipe not only with a dinner to eat, but something new – like learning the culinary term “chiffonade” and how to do it properly. 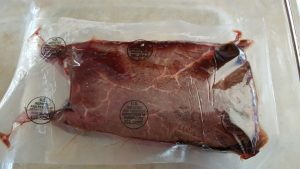 Unlike other companies, they also specifically say what safe temperature to cook your meat to – something a novice would appreciate. 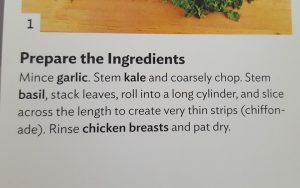 Even their more intermediate level recipes are written so well that you could easily figure out how to craft that meal. Majority of their recipes are also family-friendly – so the kids could help. Home Chef works for couples, large families and definitely those with kids. 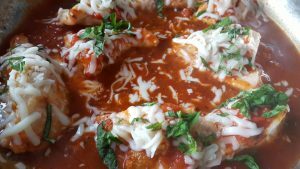 Their recipes are family-friendly, the recipes quick and simple to make (so you can feed a hungry crowd fast) and the per serving price is fairly reasonable. At $9.95 per serving, this is probably one of those fun here-and-there-type of kits for couples and families – because most people couldn’t afford to pay that much per week. 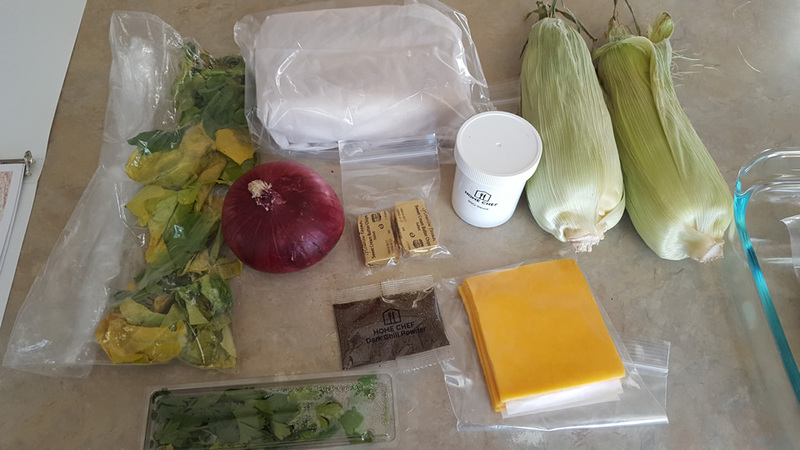 Culinary Tidbits and Lessons: It is nice when a meal delivery kit takes it a step further and teaches you something. 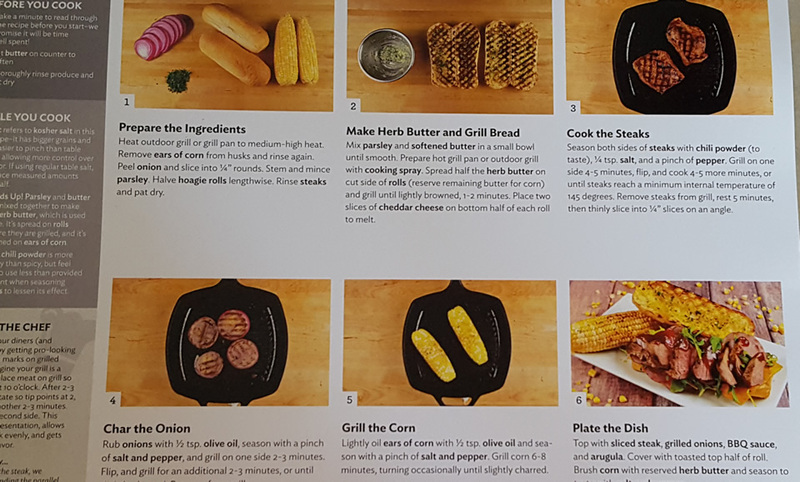 Home Chef by far has the most culinary and cooking tips we’ve seen – teaching you everything from the French term to telling you what temperature equates to medium, medium-rare and even well-done steaks. Generous Meal Selection Amounts: Overall, the serving portions were extremely generous – easily feeding two people. In fact, our two-serving meals split between three adults and one four-year old with ease. Teaches You to Reuse Pots and Pans: When you cook Home Chef’s meals, you will notice that they try to reduce waste. Several times in their recipes they have you wash and reuse a bowl or pan. While it might not seem like a big deal, less cleanup after eating is great to me – and I personally have a pet peeve when recipes have you pull every dish from your kitchen for a single meal. Temp and Exact Measurements Provided: When temperatures and exact measurements are included in a recipe, it ensures there’s no mishaps. A lot of these dinner kit services will say add a large drizzle of oil, but what is a large drizzle? Home Chef tells you exactly how much to add and even tells you what temperature to cook the meat – such as 165 F for chicken. 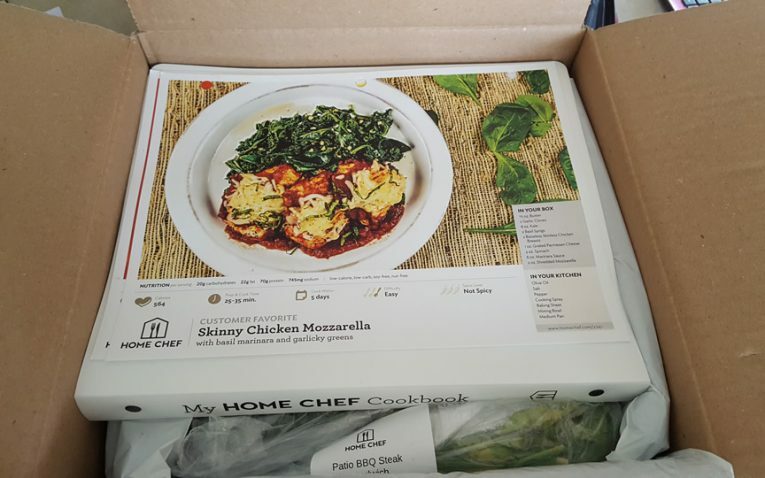 Recipe Book: When you order from Home Chef, your first shipment comes with a binder. All recipe cards from Home Chef are already punched with a three-hole punch so that you can put them straight into the binder. Referral Program: We always appreciate when companies reward customers for recommending them. 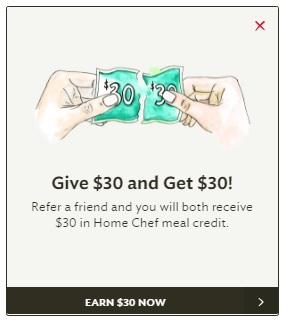 Home Chef offers current customers a $30/$30 reward. When you refer a friend, you get $30 off your next order and they get $30 off their first order. Fresh Products Not as “Fresh”: There were some issues with freshness. I had some wilted greens, missing corn kernels and beef that looks unappetizing. 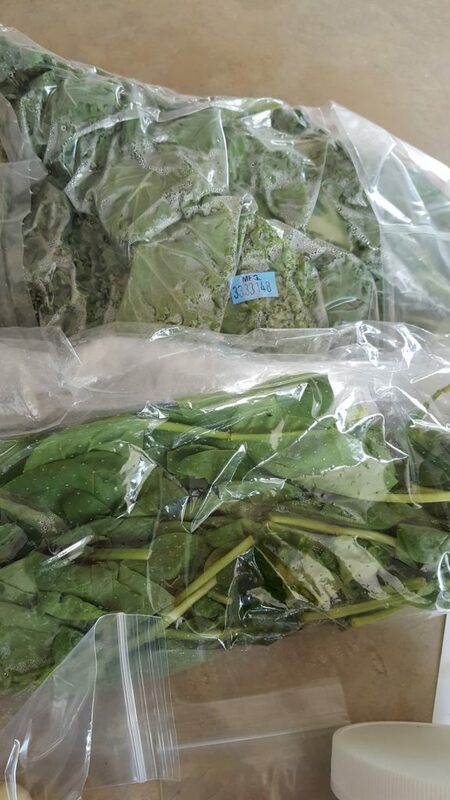 While shipping takes its toll, compared to other companies, Home Chef had some glaring freshness issues. No Labels on Meats or Fresh Herbs: If you are a novice chef, you may not be able to eye the difference between fresh herbs – especially parsley and cilantro. 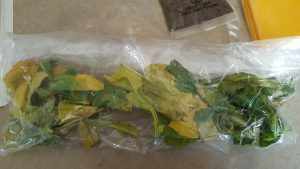 Because it is not uncommon for human error – and ingredients to be swapped – you think the herbs and products would be labeled. 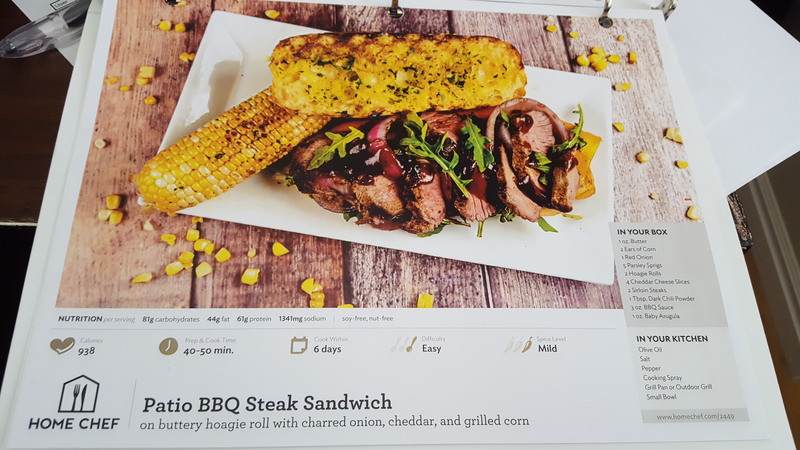 Also, meats from Home Chef weren’t labeled – and when you have similar meals for the week (such as several beef dishes), it can be hard to tell which package of beef is what and what recipe it goes to. Flavors Too Simple: Home Chef uses a lot of fresh herbs and innovative sauces, but the end result is still rather bland. You would expect something more flavorful and exciting to the tastebuds, but most of these recipes were just so-so. 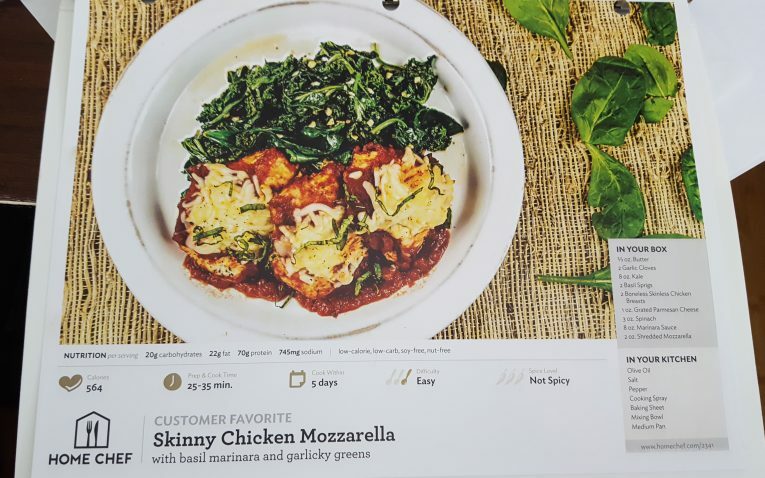 No Discounts for Larger Orders: Usually, a meal kit will give you a per serving discount if you order more servings or meals per week. 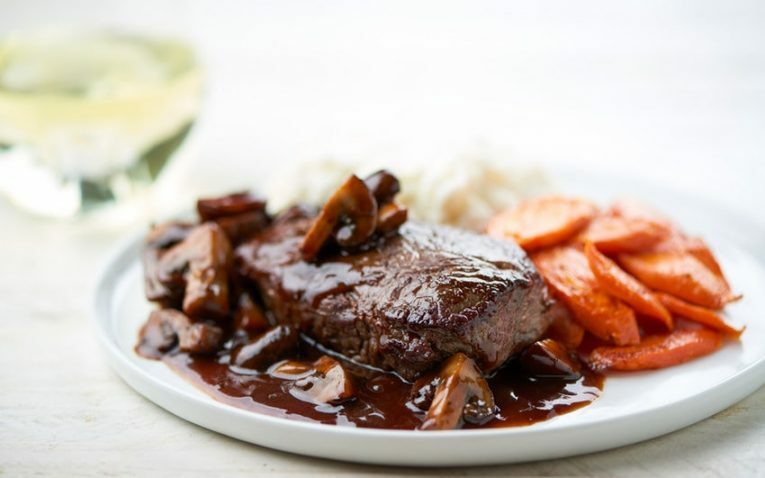 But, Home Chef sticks to their $9.95 per serving no matter what – making it costly for some to try weekly. No Storage Info: This seems to be a continuing trend amongst most of these meal delivery kit companies, but Home Chef is also guilty of not telling you how to store the items they give you – so you assume it all goes in the fridge. 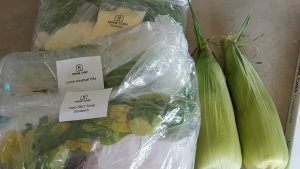 They do clearly state that everything should be cooked within five days, but they don’t tell you how to expand the freshness window – like storing your onion at room temp instead of in the fridge. 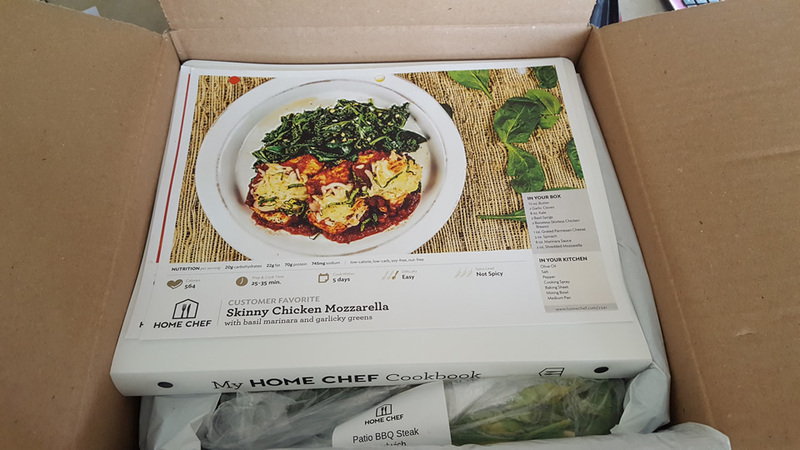 Overall, Home Chef is a great dinner kit for those that want to try something new, have no limitations on their choices and even order up large serving counts for the entire family. While they have a few areas where they could improve, we would still order from them again.